Farm Expert 2019 for Nintendo Switch includes over 20 unique agricultural machines and four open worlds, as well as over 50 hours of gameplay. 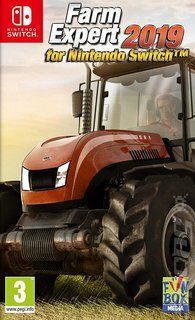 Drive machines, manage resources and experience a broad selection of agricultural activities. You can plough, fertilise, harvest grain, breed cows, grow fruit orchards and buy and sell resources. - Over 20 agricultural machines. - Four game worlds (American, British, German and Spanish farms). - Over 50 hours of gameplay. - Cow breeding, comprehensive field labour and fruit-growing. - A store to buy necessary materials and machines.